Hiking is one of my absolute favorite things to do! These are the same hikes that I did when I first started hiking, so it’s definitely a great place to start. I will be sharing more of my favorite hikes with you and will categorize them by skill level. Please make sure you know your level and only do intermediate and advanced hikes when you’re ready. Without further rambling (so you can get trekking), here’s a list of 5 fun & easy hikes in Los Angeles for beginner hikers! This is the most popular hike in the city. There are easy routes and more intermediate ones, depending on which path you take. This one is about 2-3 miles if you do the basic one, with great views of Downtown, Hollywood, and the Westside at the top. There are off-leash dog areas so you’ll see a lot of pups running around. You’ll also see the colorful personalities of LA on this hike as it attracts different types of people, from tourists to celebrities. This one is one of my favorites and it’s much more low-key and less crowded then the other hikes on this list. I start off on Scott Ave. and take the trail through the Grace Simons Lodge. There’s a nice hill with a view of the Downtown LA skyline in the background where many dogs run around. Heading North, you will get to the top which gives you a nice view of Downtown and behind you is a view of Glendale, Burbank and North Hollywood. You can add on some additional mileage on the way back if you go South of Scott where there’s a park at the end of the road with more great views. I usually start this hike from the Greek Theater so I can hike up to the Griffith Observatory. I love doing this hike in the evenings to catch the sunset up at the peak. 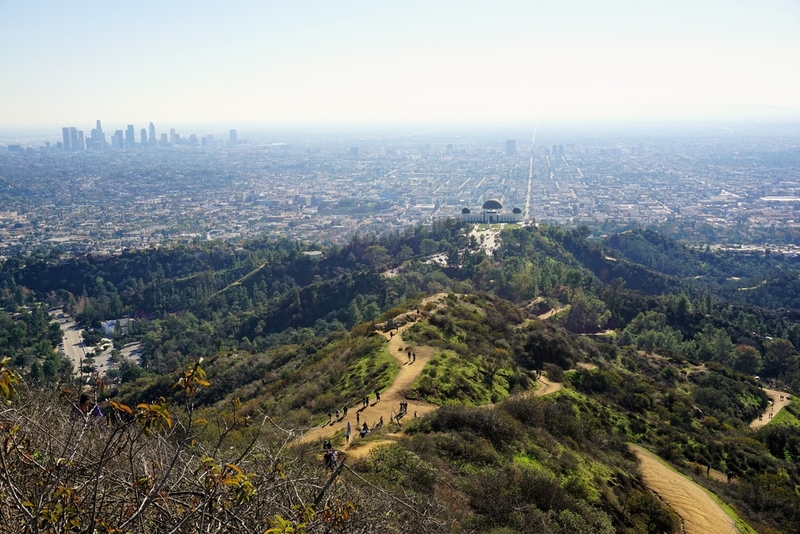 From the Griffith Observatory, you cut through the parking lot to get to the main trailhead and there are three different ways you can take. The beginner route takes you to a wide path, and it’s a bit longer than if you take the intermediate or harder route. You’ll see the hard route, since it goes straight up and there’s a pipe there that you can use to help you go up. Once you get to the top of Mt. Hollywood, there are gorgeous views of the city, the Downtown LA skyline and the Hollywood Sign. This one is a good one if you like waterfalls. I can’t promise you a huge one, since sometimes this one only gets a trickle depending on the rainfall. It’s located in Pasadena and though there’s a parking lot, it can get pretty full on weekends. The trailhead is easily marked and this one requires you to go through some streams and over some boulders. It can be tricky some times and even I’ve slipped and fell a couple of times. Once you get to the waterfall, you’ll see some people playing in the water and hanging out. Not many people know about this one and I don’t mind that. My mom hikes this one on a daily basis, so don’t forget to say hi when you see her. These hills are very pretty with wildflowers and gorgeous views. It really feels like you’re in another place, I always tend to think of the Sound of Music movie when I’m there. There are different trails here too and I usually do a whole loop around, and sometimes twice. If you go the the left trail, you’ll see awesome views of Downtown LA. If you go up through the center trail, you’ll be surrounded by beautiful hills that will inspire you through your ascent. You can also try the right which starts off at a very steep incline, but you’ll feel great once you get to the top – I promise! If you’re ready to move on to the next level, check out my list of top intermediate hikes in Los Angeles and a mix of beginner to advances hikes in LA in this list of 13 Healthy Hikes Every LA Girl Should Do At Least Once.